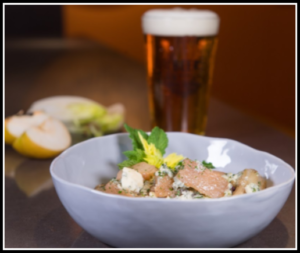 Image of IPA Braised Endive with Blue Cheese and Asian Pear taken for the Beer Institute. Recipe was created by Chef Laurent Aubel. Marinade: In a medium bowl combine herbs, orange and lemon peels, IPA beer, garlic, shallots, olive oil, tarragon vinegar, and agave, stir marinade until smooth. Trim bruised leaves from the endive, leaving whole. In a baking dish, add endive and pears in a single layer. Cover with marinade and salt and pepper to taste. Cover with aluminum foil and cook for 1 hour at 325 degrees F.
Just prior to serving, sprinkle with blue cheese and chopped parsley.